Mickey Mouse artworks by Damien Hirst first began in 2012 after Hirst was invited by Disney to create an artwork inspired by Mickey Mouse. 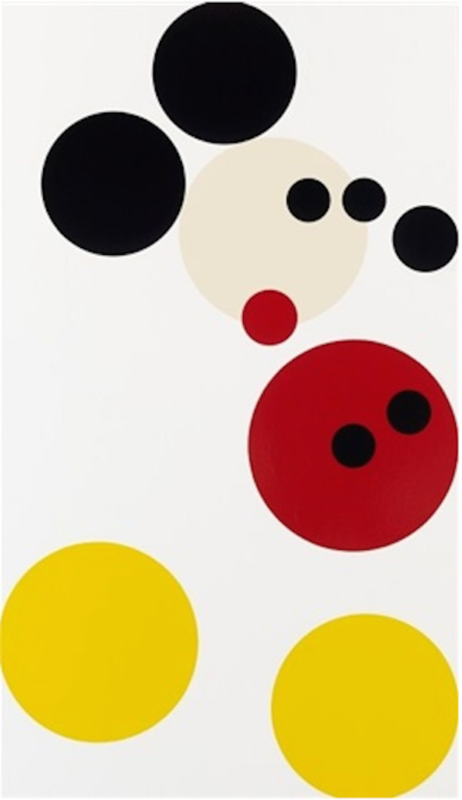 The painting was auctioned at Christie’s, London, on 13 February 2014 in aid of Kids Company, a charity Hirst has long supported, raising almost 1 million British pounds. “The thing about Mickey is that even though he’s gone through so many shifts in form and association, he’s timeless. In a way he means the same in the 21st century as he did decades ago. I watched the cartoons as a kid, and my kids watch them too. He’s relevant because he’s remained so culturally ingrained and he still just looks so great. The way children are entertained today has obviously changed dramatically, but kids are still kids, and love the same things. Since the late 1980’s, Hirst has used a varied practice of installation, sculpture, painting and drawing to explore the complex relationship between art, life and death. Explaining: “Art’s about life and it can’t really be about anything else … there isn’t anything else,” Hirst’s work investigates and challenges contemporary belief systems, and dissects the tensions and uncertainties at the heart of human experience.